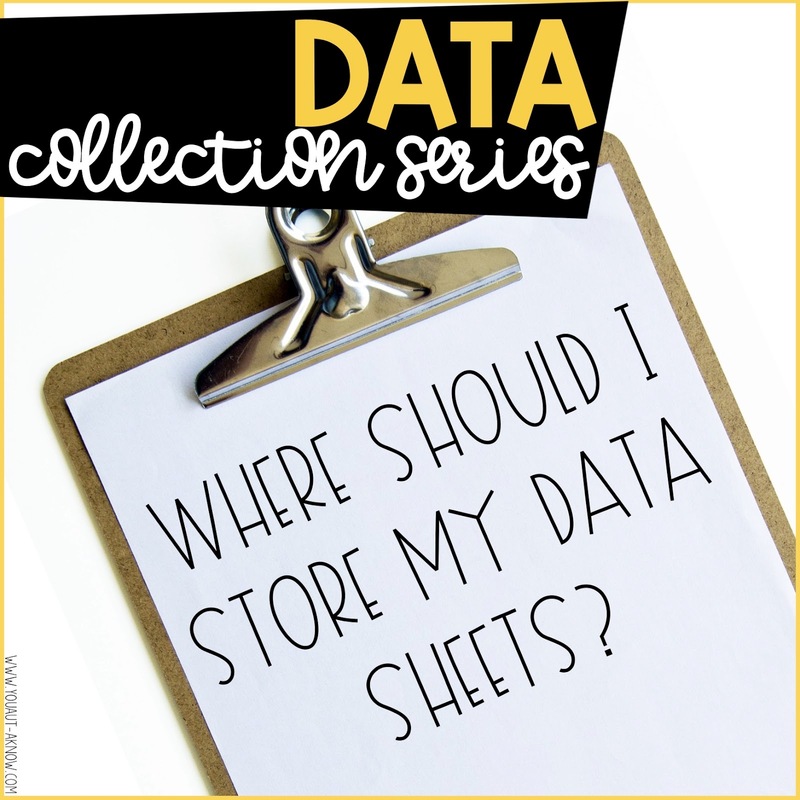 Data Collection Series: Where should I keep data sheets? 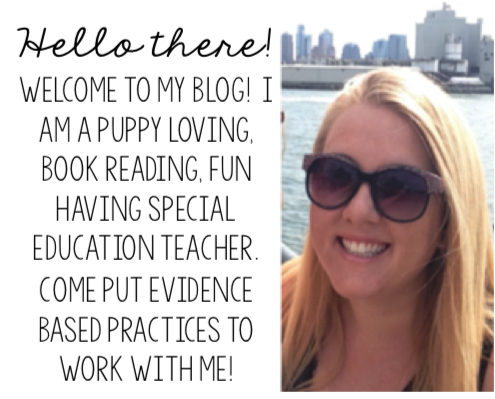 I'm back talking about data collection in the classroom. We've talked about what skills you should be collecting data on and how to choose the right data sheets. Now it's time to talk about where you're going to store all these data sheets. I have one quick and simple tip that helps with data collection throughout the school day. I like to keep data sheets where the data is being collected. There's no running around and looking for data sheets. When we're working on a specific skill (independent work, communication skills, toileting, etc.) we have the data sheets right there where we need them. Now does this mean my toileting data is always going to live in the bathroom? No. That's going to make it pretty hard to review the data. I mean, I can review the toileting data in the bathroom, but who really wants to do that? First, I collect the data. Like I said earlier, I store data sheet where the skill is occurring. If the skill occurs in more than 1 place in my classroom it's likely that I'm going to have more than 1 data sheet in my classroom for the same skill. Second, I fill up that data sheet. I keep collecting data on my sheets until they are full. Third, I file the data in student binders. Each of my students has a binder with all of their information. It holds IEP goals, lessons we're working on, basically everything. When my data sheets are full they get placed behind the "data" tab in their binder. When I have time to sit down and review data, I am quickly able to pull out data sheets for a skill and see how my student is progressing. These are 2 of the data collection systems I have in my classroom. I have stored all of my data, visuals, etc in these filing containers. The first one is by the front door of our classroom. I keep all of our active transition data sheets in here so my staff and I can grab and collect data and return it to the file container. When the sheets are full, they transition to the student's binders. This is also where I keep bathroom data sheets that need to be filed into binders. Because I don't always have time to file these data sheet away right after our bathroom trips, I keep them in the back of this file container and when I have a few extra minutes I will sort an file the bathroom data. The bottom system is similar, but it lives near our classroom play area because that's where we are conducting PRT lessons in our classroom. Each student has a folder and blank PRT data sheets are kept in the colorful folder so they're easy to grab and go during PRT lessons. I keep each student's data in their folder and transfer it to their binder after it's been analyzed and calculated. I know this may sound like such a silly tip "keep data sheets where you want to collect the data" but it's something that really works for me and my program. 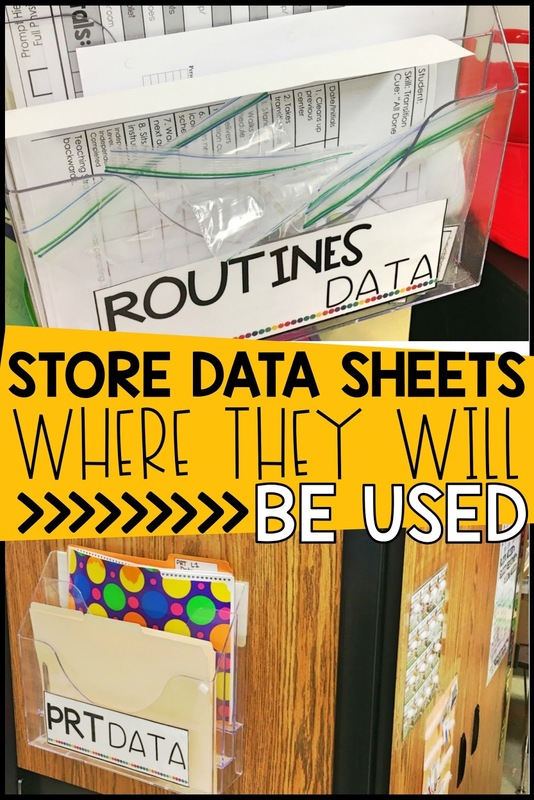 Do you have any tips you use for storing data sheets? Let me know in the comments.